UPDATE: watch the Tele-MAGMaS demonstration at the Hannover Fair! Tele-MAGMaS stands for Human-in-the-loop Multi–robot Aerial–Ground Manipulation System. The manipulation of long, often flexible, objects is a key challenge for application such as search and rescue after disasters or robotics constructions in remote or dangerous area. Our application proposes a unique approach to tackle limitations of aerial- and mobile ground- manipulation, by combining an aerial manipulator with a ground manipulator, mitigating the drawbacks of each individual solution. The high level control of such a complex system is done trough a tele-presence framework with haptic and visual feedbacks, human capacities to handle unstructured environments and versatility outperforming fully-autonomous solutions. This system features robot-robot collaboration, but also human-robot interaction through the tele-presence framework. The team is lead by our group at LAAS-CNRS and brings together the group of people working with me at LAAS-CNRS together with Domenico Prattichizzo's group at University of Siena in Siena, Italy, the people working with Paolo Robuffo Giordano at CNRS at IRISA in Rennes, and Dongjun Lee's group at Seoul National University, in Seoul, South Korea. 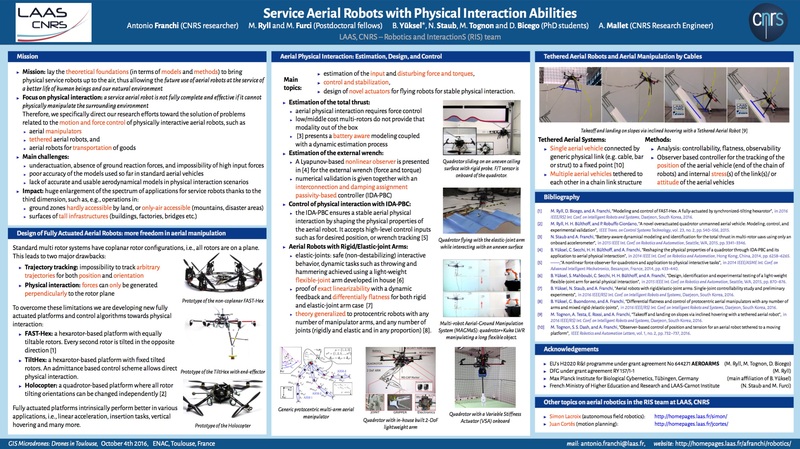 Together the four groups have strong expertise in the fields of aerial manipulation, tele-operation, grasping, haptics, industrial manipulation, vision-based control, robotics for extreme environments and search and rescue robotics. The group members are involved in several European projects (Aeroarms, WEARHAP, ACANTO, RoMaNS, just to mention a few). The Kuka Innovation Award (www.innovationaward.kuka.com) is a very competitive worldwide award sponsored by Kuka to stimulate high quality and innovative research in the domain of human robot cooperation and manipulation. The final phase of the award consist in live demonstrations at the Hanover Fair 2017.